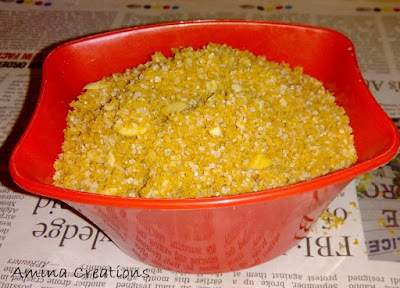 Maleeda is a popular sweet dish in the North Arcot district of Tamil Nadu. It is a special sweet often made during Muslim weddings. The method of making Maleeda is very simple but time consuming process. So it is usually prepared 2 or 3 days before a wedding. Now roll out small pooris using the dough and arrange them on a clean white cloth. Allow this to dry in shade for atleast 20 hours. By then the pooris would have hardened. Now break each into 4 pieces and heat oil in a pan. When oil is hot, deep fry the pooris till they are golden brown in colour. Allow the pooris to cool down completely, and gently crush them with your hands or a dosa ladle. Grind this in small batches to a powder. Use a large holed sieve to filter the powder so that it is smooth. I use my colander to sieve the powder. Once ready, take the powder in a large bowl and add sugar to this and mix well. Add more sugar if you want it to be more sweet. Heat ghee in a pan and add the chopped almonds. Saute till golden. Add this diretly to the maleeda and mix well. In the same way, you can sauté the cashews till golden and add this as well. Mix all the ingredients well and transfer to small air tight containers. Maleeda stays fresh for about 10 days and you can have it with a spoon whenever you get hunger pangs.